Begin the registration process at your convenience by following the steps below. Contact Myra.Liwanag@ipbahay.org with questions. Review Important School Information, including communications channels and Parent Volunteer Service Requirements. Visit the IP Parent Resource Folder and download your own copy of the IP Calendar and other helpful information for parents, family events, and the IP Handbook. Pay tuition by cash or check to “Iskwelahang Pilipino.” There is a separate fee for Rondalla lessons. Online payment using Paypal is coming soon! School Age Children’s Program Tuition: $70 first child, $60 second child, $50 third child, fourth child free (Age 3-18). See IP Classes Overview for more information. Rondalla Instrumental Instruction Tuition: $70 first student, $60 second student, $50 third student, fourth student free (age 8 and up). This is a separate fee from the children’s program and registration is open to adults. See Rondalla Program Overview. Lowell Service Program Fee: IP is dependent upon help from families to defray the cost of student tuition. 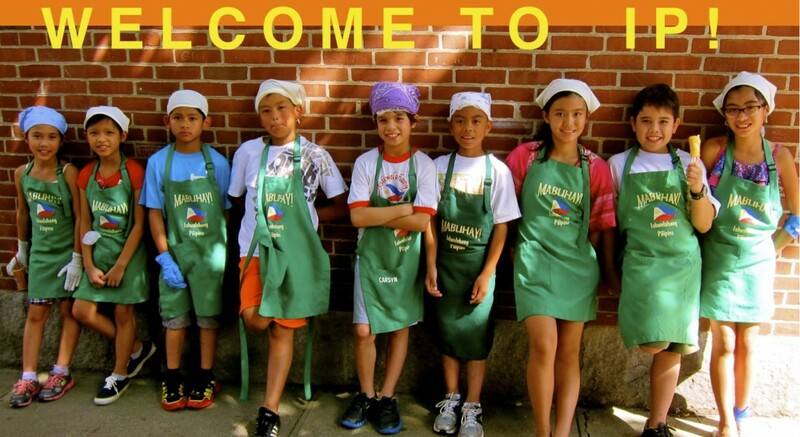 Families are required to serve a total of 3 six-hour shifts for the Lowell Folk Festival (one prep session and two at the IP’s Fiipino Food Booth). LOWELL HOURS MUST BE RECORDED. In addition, parents also expected to sign up for at least one IP committee and serve merienda. Returning families who did not fulfill the Lowell service requirement will be billed a Service Program Fee of $150 at registration.